What is chronic fatigue syndrome (CFS or SEID)? What causes chronic fatigue syndrome or systemic exertional intolerance disease? What are risk factors for CFS/SEID? What are systemic exertion intolerance disease or chronic fatigue syndrome symptoms and signs? What are CFS/SEID symptoms in men? What are SEID/CFS symptoms in women? What tests help diagnose chronic fatigue syndrome (or systemic exertion intolerance disease)? What is the treatment for CFS/SEID? Is there a cure for CFS/SEID? What is the prognosis (outcome) for CFS/SEID? Is it possible to prevent CFS/SEID? Where can people find additional information about CFS/SEID? Chronic fatigue syndrome (CFS) is defined by two major criteria, chronic severe fatigue for at least six months not caused by a diagnosable disease or relieved with rest and at least four other specific symptoms that occur at the same time or after the development of severe fatigue. In 2015, the Institute of Medicine proposed a new name for this syndrome -- systemic exertion intolerance disease (SEID). The cause of chronic fatigue syndrome (CFS or SEID) is unknown. Risk factors are not clearly understood, but the majority of adults diagnosed are adult women from 40-50 years of age; pediatric patients diagnosed are usually teenagers. The symptoms and signs of chronic fatigue syndrome (CFS or SEID) are relatively specific: chronic severe fatigue for at least five to six months not caused by a diagnosable disease and at least four other specific symptoms such as cognitive impairment, muscle and/or joint pains, new types of headaches, tender lymph nodes, sore throat, unrefreshing sleep, and malaise after exercise that occur at the same time or after the development of severe fatigue. The estimated prevalence in the U.S. is about 836,000 to 2.5 million people. Chronic fatigue syndrome or SEID is diagnosed about four times more often in women than men. CFS/SEID is diagnosed by five to six symptoms or signs; there is no definitive test for CFS/SEID. Treatment of chronic fatigue syndrome (CFS or SEID) is based on treating the symptoms patients exhibit. Although there is no known cure for CSF or SEID, symptoms may be markedly reduced. The prognosis for chronic fatigue syndrome (CFS or SEID) in adults is only fair to poor; children have a better or good prognosis with treatment. Adopting a healthy lifestyle is the usual preventive advice given by clinicians that treat chronic fatigue syndrome (CFS or SEID) patients. Additional sources of information and support groups are available for chronic fatigue syndrome (CFS or SEID). The diagnosis of chronic fatigue syndrome (CFS) means that the sufferer has experienced fatigue for at least six months in the absence of known medical causes as well as had other characteristic symptoms. The Institute of Medicine (IOM) committee recommends the name systemic exertion intolerance disease (SEID) for this disease, and it has also been referred to as myalgic encephalomyelitis (ME), even though no evidence of inflammation of the brain (encephalitis) has been demonstrated with this condition. In addition, four symptoms of the symptoms listed above must have persisted or recurred during six or more consecutive months of illness and must not have predated the severe chronic fatigue (the symptoms must have occurred at the same time or after severe chronic fatigue appeared but not before). Chronic fatigue is a symptom of many illnesses, so chronic fatigue syndrome had to have criteria that distinguished it from similar medical conditions that have chronic fatigue as a major symptom (for example, fibromyalgia, chronic mononucleosis, neurologic problems, Lyme disease, and sensitivity to certain chemicals). Other treatable illnesses and conditions that may have chronic fatigue as one symptom among many others include hypothyroidism, cancers, immune system or autoimmune diseases, adrenal gland problems, subacute or chronic infections, obesity, sleep apnea, narcolepsy, reactions to medicines, hormonal disorders, schizophrenia, bipolar disorders, eating disorders, depression, alcohol and substance abuse, psychosomatic problems, and malingering. In addition to the two criteria above needed to fit both the definition and diagnosis of CFS, many patients have additional symptoms that, depending on their severity, may predominate and overshadow the CFS symptom criteria. These symptoms include chest pain, abdominal pain, shortness of breath, chronic cough, diarrhea, nausea, night sweats, jaw pan and muscle stiffness, double vision, and psychological problems such as panic attacks, anxiety, and depression. There is no laboratory test that can give a definitive diagnosis of CFS, and there are no physical signs that specifically identify CFS. Consequently, the disease is diagnosed by excluding the diseases that may cause the symptoms (termed a diagnosis of exclusion) listed above yet still fit the two defined criteria established by the panel of CFS experts in 1994. It is not unusual for patients to undergo an extensive battery of tests to rule out other diseases before a patient is determined to fit the CFS diagnostic criteria. Unfortunately, many patients who have subsequently been diagnosed to have CFS also have had some of the conditions and symptoms listed above. Without the CFS criteria, diagnosis would even be more controversial. Controversy still remains. Some individuals want to rename the disease. Some clinicians want to change the 1994 criteria and others do not. Until a definitive cause is proven, controversies about names, diagnosis, treatments, and other aspects of CFS will likely remain. In February 2015, the Institute of Medicine, at the request of the CDC and others, completed a report on myalgic encephalomyelitis/chronic fatigue syndrome. The new report suggested a name change to systemic exertion intolerance disease (SEID) to better identify the disease with less prejudice and also slightly modified some criteria of the disease. Because this report is so new and is undergoing review, it is not clear if all of it will be accepted by the medical community. The CDC has yet to make name changes in its CFS publications so this article will present information on both the current CFS and the new SEID; in most instances, the basic information has not changed (for example, cause, symptoms, and treatment). No defined cause of CFS or SEID is known, even after about two decades of research on patients who fit the CFS or SEID criteria. Although many diseases coexist with CFS or SEID in patients, there are no proven links to any known disease (physical or mental) or pathogen (including viral) that is responsible for CFS or SEID development. The Centers for Disease Control (CDC) indicates that researchers are still trying to identify the cause(s) of CFS/SEID and offer some speculation about the ongoing research. For example, they suggest the possibility that CFS/SEID represents an endpoint of multiple diseases or conditions such as viral infections, stress, and toxin exposure. However, the CDC states that "CFS is not caused exclusively by any single recognized infectious disease agent." This includes Epstein-Barr virus, Lyme disease bacteria (Borrelia burgdorferi), human retroviruses, bornaviruses, fungi, Mycoplasma spp, flu or flu-like viruses, and many others. However, if a person has been infected with several (at least three) different pathogens, the chances of getting CFS/SEID goes up. In addition, some researchers had suggested that a new virus found in some CFS/SEID patients (termed XMRV or xenotropic murine leukemia virus-related virus) may be a candidate for cause, but a recent larger study has disproven this theory. In addition, although the CDC says no autoimmune changes like lupus or other diseases are found in CFS/SEID, many CFS/SEID patients have high levels of immune complexes and anti-self antibodies in their blood that may be a clue about what causes CFS/SEID. The CDC mentions other findings (allergies, T-cell activation, and cytokines), but none have any direct link to causing CFS/SEID. Without knowing the cause of CFS/SEID, it is difficult to determine risk factors. However, statistics gathered about people with diagnosed CFS/SEID do tell something about some high-risk groups. For example, although people of every age, gender, race, and economic group can get CFS/SEID, it is most commonly diagnosed in people in the 40- and 50-year-old age group. In addition, CFS/SEID is diagnosed about four times as often in women (some investigators consider menopause as a possible risk factor). In the pediatric-aged group, teens are most often affected. The symptoms and signs of CFS/SEID are complex but specific. The patient must have severe chronic long-term fatigue of six months or longer duration with other known medical conditions excluded by clinical diagnosis. In addition, the patients have four or more of the following symptoms that either occurred at the same time or after the severe chronic fatigue. The symptoms are substantial impairment in short-term memory or concentration; sore throat; tender lymph nodes; muscle pain; multi-joint pain without swelling or redness; headaches of a new type, pattern, or severity; unrefreshing sleep; and post-exertion malaise lasting more than 24 hours. Patients may often have additional symptoms such as double vision, mild fevers, earaches, diarrhea, and many other symptoms, but they do not fit into the criteria that are considered to be part of the definition of CFS. CFS/SEID symptoms in men need to fit the time and type (six months and four symptoms) criteria stated above to be diagnosed with the disease. Currently, chronic fatigue syndrome is diagnosed much more frequently in females than in males. General symptoms in men that can occur that are described by male patients are similar to those in females, but clinicians speculate that many men are reluctant to say they have symptoms of muscle pain, malaise, headaches, and other symptoms due to cultural inhibitions and training. Many doctors speculate that men need to be more open in describing their symptoms to their doctors. As stated above for men, CFS/SEID symptoms in women need to fit the time and type (six months and four symptoms) criteria stated above to be diagnosed with the disease. Women are much more likely to be diagnosed with chronic fatigue syndrome than men. Clinicians speculate that women are more forthcoming with their doctors about chronicity of symptoms, including the four major symptom criteria (substantial impairment in short-term memory or concentration; sore throat; tender lymph nodes; muscle pain; multi-joint pain without swelling or redness; headaches of a new type, pattern or severity; unrefreshing sleep; and post-exertion malaise lasting more than 24 hours) than are men because of cultural expectations and training. Chronic fatigue syndrome (CFS) or SEID is a diagnosis made by excluding many diseases that have chronic fatigue as a major or frequent symptom. Unfortunately, there are no physical signs or diagnostic tests (blood tests) that identify CFS. The diagnosis is made by fitting the two major criteria set out by a group of CFS research experts. The first criteria states the patient must have severe chronic fatigue of six months or longer duration with other known medical conditions excluded by clinical diagnosis (a diagnosis by exclusion). post-exertion malaise lasting more than 24 hours. When taken as a group, these tests support a diagnosis of CFS but are not definitive; only the patients who meet the two established criteria described above for CFS are definitively diagnosed with CFS. There is no known cure for CFS/SEID chronic fatigue syndrome; treatment is based on those therapies that reduce the symptoms. In general, patients who are diagnosed within the first two years of symptoms respond better to symptomatic treatment than those patients diagnosed after two or more years of having the disease. Treatments to reduce symptoms are individualized for each patient as no single therapy helps all CFS/SEID patients. Drug therapies (bupropion [Wellbutrin], sertraline [Zoloft], and other antidepressant drugs) are used to treat symptoms of sleep, pain, and psychological problems. Some have used Adderall (off-label use). Other therapies that are used include stress reduction and lifestyle changes (which may include diet and exercise reduction). Some investigators suggest diet and nutrition play a role and recommend vitamin D, B6, B12, lysine, and glutathione supplements while others do not. Some clinicians may prescribe antibiotics such as metronidazole (Flagyl) or amoxicillin and clavulanic acid (Augmentin) if the patient has high levels of antibodies that react with C. pneumoniae or other organisms. Other treatments that claim some positive effects on CFS symptoms include holistic treatments such as bananas, maca (a plant root from Peru), pau d'arco (herb from the bark of the taheebo tree in Central America), and spirulina (plankton). Acupuncture also is claimed to help CFS patients with moderate support in the literature. Light therapy has also been advocated but has no support in the literature, and at least one article has questioned melatonin or phototherapy's effectiveness. Most of these other therapies have not been well studied by experts who treat CFS. Most clinicians agree that patients with CFS need a team approach to their illness. The most disruptive symptoms should be addressed first. In general, the therapy will be a combination of psychological counseling (to help with the day-to-day burden CFS imposes on the patient's life) and mild guided exercise (a physical therapist might be able to help; care should be taken to not be too strenuous). Cognitive-behavioral therapy seems to work well with pediatric-aged patients. Healthy diet (increasing fruits and vegetables and avoiding fatty foods); some claim adding the following herbals and diet products to the patient's diet may reduce symptoms (astragalus, borage seed oil, bromelain, comfrey, Echinacea, garlic, Ginkgo biloba, ginseng, primrose oil, quercetin, St. John's wort, maca, pau d'arco, spirulina, and Shiitake mushroom extract), but patients should check with their doctors before using such items. Because full recovery from CFS/SEID is very infrequent (only 5%-10% of adult patients diagnosed), the prognosis usually ranges from fair to poor. Many patients can only work at part-time jobs; some patients become bedridden. Mental impairment, especially memory loss and the ability to concentrate are very disconcerting to CFS/SEID patients. Even with symptomatic treatment, some patients may continue with a slow decline in their ability to function. Some studies suggest that even about two years after diagnosis and symptomatic treatment, over half of the CFS/SEID patients still were fatigued. The prognosis for children is better than that for adults as most children recover completely after about one to four years of treatment; although during recovery, they often have problems in school with attention and memory. Many will also have anxiety and depression. Researchers suggest that cognitive-behavioral therapy is a major effective treatment for adolescents with CFS/SEID. Currently, there are no known methods to prevent CFS/SEID. Development of effective prevention methods is hampered by no firm knowledge of the cause(s) of CFS/SEID. The prevention suggestions of most experts and clinicians are general recommendations that result in a healthy lifestyle since no specific prevention methods are known. Examples of the general recommendations are avoidance of viral infections, lower daily stress as much as possible, and maintain regular sleep cycles and a healthy diet, along with avoidance of the many toxins in the environment; these are cited by most clinicians as possible ways to reduce or prevent the chance of developing CFS/SEID. Females with CFS/SEID are cautioned about pregnancy because of the stresses placed on the mother and fetus. In addition, the genetic connection, if any, is not clear between the parents with CFS/SEID and their children. Because the disease seems to include multiple major disciplines such as neurology, immunology, infectious diseases and more, the NIH has developed a study group termed "Trans-NIH ME/CFS" that include representatives of various disciplines to report and design clinical studies. This group may provide more clarity on the cause and treatment of this disease. In addition, you may want to watch a documentary film by Jennifer Brea titled Unrest. The film shows her experience with this disease. "Beyond Myalgic Encephalomyelitis/Chronic Fatigue Syndrome: Redefining an Illness." Institute of Medicine. Feb. 10, 2015. <http://www.iom.edu/Reports/2015/ME-CFS.aspx>. Cunha, Burke A. "Chronic Fatigue Syndrome." Medscape.com. May 19, 2017. <http://emedicine.medscape.com/article/235980-overview>. "Myalgic Encephalomyelitis/Chronic Fatigue Syndrome (ME/CFS) Key Facts." Institute of Medicine. Feb. 2015. <http://www.iom.edu/~/media/Files/Report%20Files/2015/MECFS/MECFS_KeyFacts.pdf>. United States. Centers for Disease Control and Prevention. "Chronic Fatigue Syndrome." Oct. 15, 2010. <http://www.cdc.gov/cfs/general/causes/index.html>. United States. National Institutes of Health. "Trans-NIH ME/CFS Working Group Members." June 21, 2017. <https://www.nih.gov/mecfs/trans-nih-mecfs-working-group-members>. Is fibromyagia real? What causes fibromyalgia? Get a fibromyalgia definition and learn about diagnosis, pain, diet, symptoms, and signs. Read more: Fibromyalgia Quiz: What Is Fibromyalgia? How do you cope with chronic fatigue syndrome? What symptoms and signs did you experience with your chronic fatigue syndrome? Please describe the events that led to a diagnosis of chronic fatigue syndrome. In addition to CFS, do you have another disease or condition? Please share your story. What kinds of treatment have you had for chronic fatigue syndrome? What medications do you take? Acupuncture is the practice of inserting needles into the body to reduce pain or induce anesthesia. More broadly, acupuncture is a family of procedures involving the stimulation of anatomical locations on or in the skin by a variety of techniques. Exhausted all the time? Maybe it's not all in the mind. Take the Chronic Fatigue Syndrome (CFS) Quiz to learn more about tricky condition. Chronic fatigue syndrome (CFS) can occur at any age for men or women. Learn more about the causes of chronic fatigue syndrome (CFS) as well as tests to diagnose extreme fatigue associated with chronic fatigue syndrome. A syndrome characterized by chronic pain, stiffness, and tenderness of muscles, tendons, and joints without detectable inflammation. 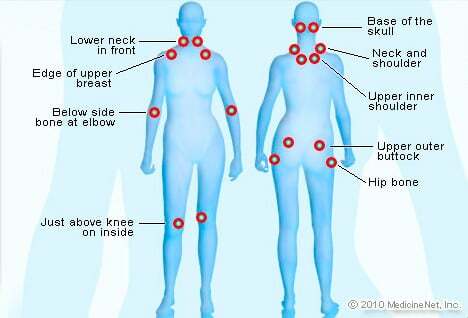 See a picture of Fibromyalgia and learn more about the health topic. Fibromyalgia could be the reason for your constant, deep bodily pain. Learn more about this painful condition with the Fibromyalgia Quiz.